These macaroons are melt-in-your-mouth delicious. They are the perfect 4:00 pm pick me up during this long week of Passover, when you are craving something light and sweet. In a small saucepan, combine apricots, water and 1 tablespoon sugar. Cook apricots over medium heat until tender and about 1 tablespoon water remains. Cool slightly and transfer to a food processor fitted with a steel blade. Add remaining sugar, egg whites and 1/2 cup coconut. Process by first using on-off spurts, and then allow machine to run until apricots are pureed. Transfer to large bowl of electric mixer. Add remaining coconut. Beat on medium speed until coconut is well blended. Stop machine and check the texture. Mixture should hold together when pinched. Conitnue to mix, if necessary. Using your hands, shape mixture into pointed cone shapes. 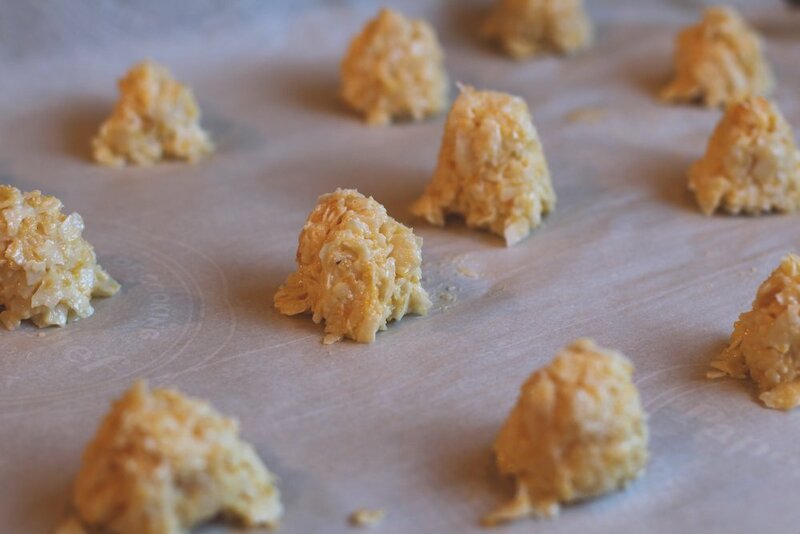 Arrange 1 inch apart on parchment paper on cookie sheets. Bake in preheated 350° oven for 15 to 20 minutes until the tops are well browned. Cool on rack. Store in airtight container. 2. Add 2 tablespoons of vegetable oil to a 9x13 pyrex pan and heat in the oven. 3. In a food processor fitted with slicing disc, slice mushrooms and sauté in 2 batches cooking on high heat until all the liquid is evaporated. Transfer to a large bowl. 4. Change to steel knife, and coarsely chop the onion. Sauté in a little hot oil. Add to mushrooms. 5. In 2 or 3 batches, using on and off turns, coarsely chop the peppers, celery and carrots together. Sauté in a little hot oil adding more oil if necessary. When soft, transfer to bowl containing the mushrooms and onions. 6. Break the matzot into small pieces. Place in a large bowl. Pour boiling water over the matzot to cover. Soak for 1 minute to soften. Drainin a colander. Add to vegetables. 7. To the work bowl add the eggs, salt, pepper and oregano. Process 10 seconds to beat. Add to vegetable-matzo mixture. Mix well. 8. Pour into heated pan. 9. Chop carrot. Sprinkle over pudding. 10. Bake for 45 miutes or until done. NOTE: The vegetables can be prepared the day ahead. The completed pudding can be prepared up to 3 days ahead. Bake for only 35 minutes. Cover and refrigerate. Sprinkle with 1/4 cup chicken soup and reheat uncovered at 350° for 30 minutes or until warm. 4. This pudding freezes well. These kosher for passover treats are so good, you might want to make them all year round! Melt the butter or margarine and brown sugar in a pot over medium heat, whisking until the mixture is melted and smooth. Cover a jelly-roll baking pan with aluminum foil. Line the pan with a single layer of matzah, breaking it as necessary to fit. Pour the brown sugar mixture over the matzhot, spreading evenly with an offset spatula to make sure every surface is covered. Bake for 10 minutes. In a medium bowl, toss the pecans, chocolate chips, coconut and cranberries. When you remove the pan from the oven, sprinkle an even layer of the coconut mixture over the top. Cut into squares while warm. The Hadley’s Date Shake is a definite highlight for the drive up to Palm Springs. However, that shake is loaded with calories. This version is half the calories and all the taste! It can also be made dairy free! I used 1% milk and Halo Top Vanilla ice cream for mine. I have also used Dreyer’s vanilla ice cream and 2% milk. 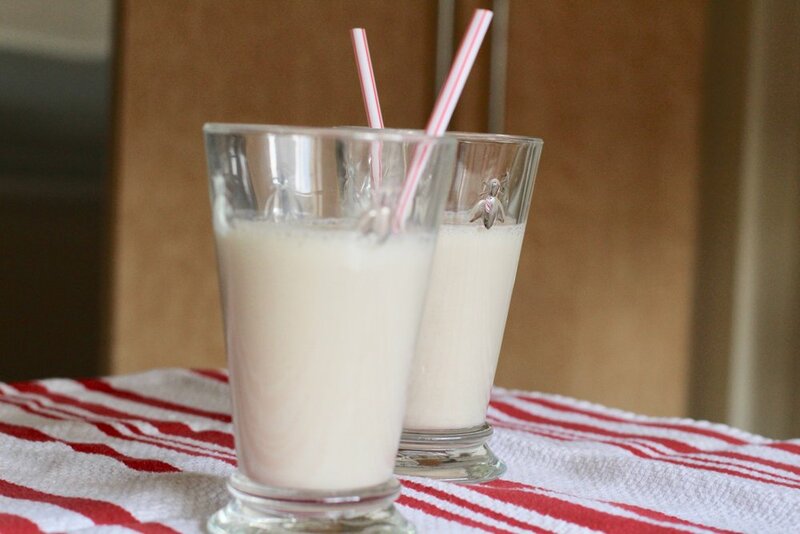 both are much lower in fat, calories and sugar than a regular date shake and still delicious! In a blender, combine the dates and milk and blend until smooth and frothy. Add the ice cream and honey and pulse a few times until smooth. Here you can see that although there is a 30 calorie and 1 gm of fat difference per half cup, the numbers change when you compare the sugar content and the extra protein form the halo top. One happy Date Shake Guy! In a bowl add Chili sauce, hoisin, soy sauce, Sriracha, vegetable oil, sesame oil, vinegar, garlic and ginger. Add the remaining 1 tablespoon to the skillet and add the scallion whites, garlic, ginger and cook for 3 to 4 minutes. Add the cooked chicken to the mixture and add water chestnuts, and the rest of the sauce and cook until the sauce thickens. What I love about this recipe is the ease with which it can be prepared…not to mention the fact that it is absolutely delicious! · Preheat oven to 450°F. Toss potatoes with 2 tablespoons oil, ½ teaspoon salt, and ¼ teaspoon pepper on a rimmed baking sheet. Roast for 15 minutes. · Meanwhile, rub salmon with 1 tablespoon oil and season with ½ teaspoon each salt and pepper. Add salmon to sheet and roast until potatoes are tender, 5 more minutes. · Turn potatoes, add Broccolini to sheet, and drizzle with 1 tablespoon oil. Heat broiler and broil all until salmon and Broccolini are browned, 2 to 3 minutes. · Whisk lemon juice, shallot, and mustard with remaining ¼ cup oil and ¼ teaspoon salt and drizzle over salmon and vegetables. This soup is thick and rich in flavor. The white beans have a sweetness to them that is complimented by the rosemary. This soup is one of my favorites! You can find dried white cannellini beans at Italian specialty shops. (In Los Angeles at Vicente Foods and Sorrentos in Culver City). In a large stockpot over low to medium heat, sauté the onions with the olive oil until the onions are translucent, 10 to 15 minutes. Add the garlic and cook over low heat for 3 more minutes. Add the drained white beans, rosemary, chicken stock, and bay leaf. Cover, bring to a boil, and simmer for 30 to 40 minutes, until the beans are very soft. Remove the rosemary branch and the bay leaf. Pass the soup through the coarsest blade of a food mill, or place in the bowl of a food processor fitted with a steel blade and pulse until coarsely pureed. Return the soup to the pot to reheat and add salt and pepper, to taste. Serve hot. There is nothing like an oatmeal cookie….except one like this! Filled with cranberries and chocolate chips, this one is absolutely delicious! My friend, Melissa, brought it to dinner last week and I asked her for the recipe. Thanks to Melissa for whipping up a batch for me this week. I think I am hooked! In a medium bowl sift flour, baking soda, baking powder, salt, cinnamon, and allspice. In a separate large bowl, cream together shortening, brown sugar, and granulated sugar until fluffy. Add eggs and vanilla. Combine well. Add flour mixture to wet ingredients and stir until just combined. Then add oats, cranberries, and chocolate and combine by hand. Bake for 8-12 minutes, or until the edges are golden brown and the top no longer appears wet. Allow to cool on the cookie sheet for a few minutes then transfer to a cooling rack. Use shortening in these cookies. It really does something beautiful to these cookies in terms of texture. You can definitely use butter instead, but the texture will change. You can use 2 teaspoons of Pumpkin Pie spice in place of the allspice and cinnamon. You can also substitute quick oats in this cookie. This recipe for baked wild cod is a winner for all the right reasons. It is easy to prepare and is a healthy and delicious meal choice. Preheat the oven to 400° and pat cod filets with a paper towel until dry. Season all over with salt and pepper. In a medium bowl, combine olive oil, cherry tomatoes, lemon slices, garlic, and thyme. Brush a baking dish with olive oil. Pour tomato-oil mixture into dish, then nestle in cod. Bake until fish is opaque and flakes easily with a fork, about 15 minutes. Preheat oven to 450 F degrees. Line a large baking sheet with parchment paper sprayed lightly with cooking spray. Set aside. In a large mixing bowl, combine olive oil, mustard, vinegar, thyme, salt, pepper, rosemary and basil, and whisk. Add the veggies and potatoes, stirring to coat. Spread vegetable mixture in a single layer on prepared baking sheet. Bake for 20 minutes, stir gently, then bake another 15 minutes.